Aloha and greetings from Kaua’i, the Garden Isle. We’re ending our last full day here and have had a lot of fun experiences over the last four days. Many tales to tell and stories to share including a beautiful beach wedding, some tasty local grinds, and some gorgeous scenery. Our return itinerary will include an overnight stay in Honolulu as well as two nights in Hong Kong. Hopefully some additional good stories to share with you from those two stops. Until then, please enjoy the remaining few days of pre-programmed blogs. Mahalo! This entry was posted in Uncategorized and tagged Hawaii, Kauai, Postcards, travel by christao408. Bookmark the permalink. lol… I hope you’re enjoying your time away. Can’t wait to see the pics and hear the stories. I don’t know how to respond to a pre-programmed blog. Maybe I need to write a prewritten comment. Haha! Mahalo – enjoy and be safe! Yay! I am envious of your trip to Kauai. : ) I understand we will be meeting for dinner tonight! I look forward to it. I am so envious of your trip to Hawaii. Glad you had such a grand time. *sigh* Sound like paradise! Hope you can enjoy the trip home as much as the vacation away! I’m jealous =) Have fun! hahaha wow, those brochures are so touristy it hurts.enjoy oahu… if you have time you might enjoy wandering around chinatown, or maybe going out to haleiwa to get some shave ice and see the beaches on the north shore. i’m curious what local kine grinds you sampled! Can’t wait to see your beautiful pics of scenery and food! Where did you find vintage travel postcards?? I would love some of those! I can’t wait for the entries about your trip. I expect professionally edited video blogs! @alextebow – The Whalers General Store in the same center as Puka Dog was selling them. Neat, huh? @kunhuo42 – Only a very short overnight in Waikiki, unfortunately. Will have to give Oahu more time on the next trip. Maybe we can coordinate schedules and you can fly there and show me around! =D@Roadlesstaken – Indeed and even have a picture to prove it. @christao408 – yes, that would be a lot of fun! @christao408 – Neat! I wish I had seen them. 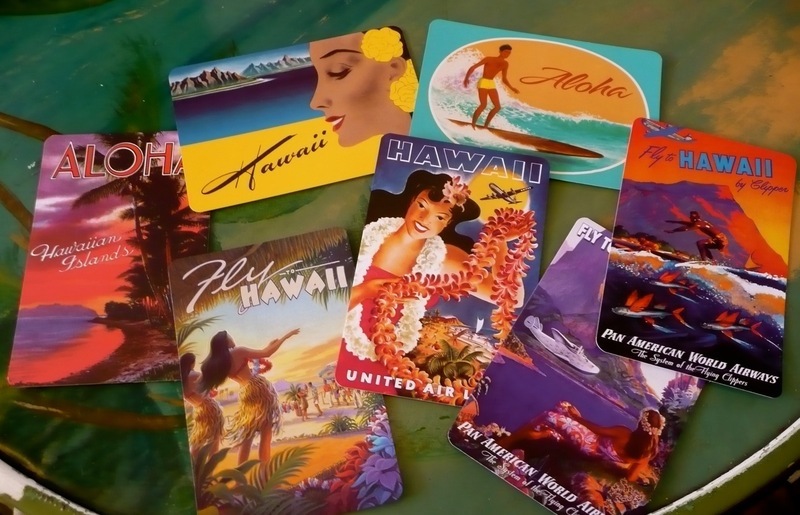 I’ve been looking for postcards like that to decorate Tommy’s somewhat-vintage-Hawaiian-themed bedroom. I’ll see if my friend can pick some up when she’s in Kauai again. Thanks!